Progress : works are being executed / in 2017 the work on all projects will be started. Replication : demonstration for other social housing landlords, inspiration projects for the 2nd MurMur campaign and similar local retrofitting campaigns in France and Europe. Could existing housing be just as energy efficient as newly built homes? Most existing buildings in cities have a poor energy performance. If we want to reach the targets set in Paris during COP21, the challenge is not so much in setting high standards for new buildings, but to increase the energy performance of existing buildings. City-zen’s aim in Grenoble is to improve the energy performance of existing buildings to the level of the current thermal regulation for new buildings in France: BBC renovation level. In order to reach this goal, social housing cooperations and associations of home owners can apply for European funding for retrofitting projects in which building are renovated according to high energy performance requirements. Social housing cooperations are stimulated to carry out retrofitting projects according to high energy performance requirements. In addition, associations of home owners have massively signed up for La Metro’s integrated support program – the MurMur campaign – to receive guidance in high energy performance renovations of their condominiums. The first edition of this campaign was highly successful (ended in 2014, 450 units retrofitted) and resulted in a waiting list for the second edition – MurMur2 – which started in spring 2016. The waiting list gathered condominiums that had already started the process of making energy audits, which is an important gain of time. In numbers: 38.031 m² of buildings concerned, 96 to 70 /60 kWh/m²/year as energy performance targeted, €1.9 million euro allocated, 370 tonnes per year of CO2 saved. 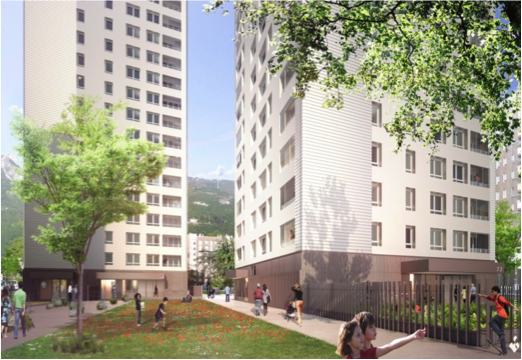 By now, 8 projects with more than 500 dwellings (equaling 44.000m²) have been identified to be retrofitted in Grenoble. The construction works of at least three buildings will start before summer 2017 and the first condominium would have voted positively to start the work too. The first retrofitted building in Grenoble will be delivered in September 2017: it is a small pre-war building of 5 dwellings with heritage value, own by the local social landlord Grenoble Habitat. If your condominium is interested to take part in MurMur2 campaign, please contact the Local Energy Agency – ALEC– for more information. City-zen : make things happen!